I spent the early part of last week staying with a friend in Amsterdam, as a result of which I can claim to have been there for the abdication of Queen Beatrix and the inauguration of King Willem-Alexander...or if not there exactly, at least somewhere in the immediate vicinity of those momentous events taking place. 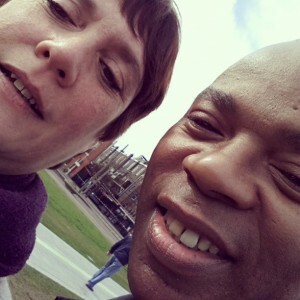 The picture was taken at Museumplein, where during the day several acts performed on stage and after nightfall, André Rieu and his orchestra played their waltzes, though by then I was already on my way back home. 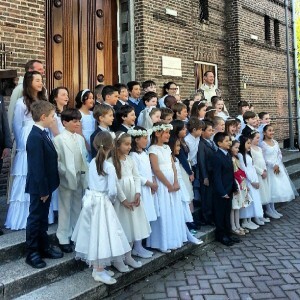 (We had asked that the parents bring their children at 9:15 for the professional photoshoot prior to Mass, but many still arrived late and are missing from this picture - not my class though; they're all in there). Hee! I can see how Nano might be a bit of an imp, for sure. He came with a warning of having been diagnosed with ADHD -- but he also came with a sunny disposition and proved easy to get along with. Aren't they sweet? And I like the picture of you and your friend. To be honest, I think I've been very lucky: all my pupils have been great kids. Stanislaw (Stash) and I had a common interest in (biblical) archaeology, and Adriano (Nano), who I had been warned has ADHD, proved easy enough to get along with. They're adorable! 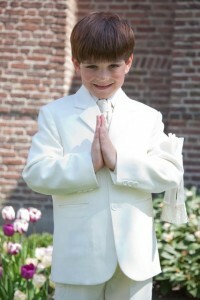 I used to be so jealous of the little Catholic girls in their lovely first communion dresses. Being a Lutheran, I didn't have mine until I was fat and fourteen. The most unattractive age, and a frumpy dress to go with it. 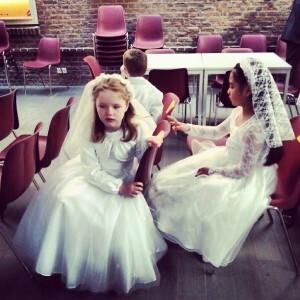 As someone who converted to Catholicism as an adult, I never had any personal experience of this ritual of First H. Communion, either (I had mine directly after my baptism and confirmation). I have really enjoyed serving as a catechist this year, and have put my name down for next year, too. Not sure yet whether I'll be teaching 2nd grade again, but if I am, I should now have a better idea of what I'm doing. I just made it up as I went along this year, but the kids seem to have enjoyed it, and the parents have been unanimous in their praise.